Veenat (Imatinib Mesylate Tablets) are used for the treatment of adult and paediatric patients with Ph+ CML (Philadelphia chromosome-positive chronic myeloid leukaemia) as well as to treat patients with Kit (CD117) positive unresectable and/or metastatic malignant GIST (gastrointestinal stromal tumours). Veenat tablets (Generic Gleevec) are manufactured by Natco Pharma Limited in the strengths of 100 mg and 400 mg.
We also have in stock Generic Gleevec (Imatinib Mesylate tablets) which is used for the treatment of newly diagnosed adult patients with Philadelphia chromosome positive chronic myeloid leukemia (CML) in chronic phase. We supply original Veenat tablets manufactured by Natco Pharma Limited. The active ingredient present in Veenat tablets is Imatinib Mesylate. Each Veenat tablet contains 100 mg or 400 mg of Imatinib Mesylate. Generic Imatinib Tablets (Veenat by Natco) is used to treat certain types of leukemia in adult and pediatric patients. Generic Imatinib is also used to treat gastrointestinal stromal tumours(GIST), a type of tumor most often found in the wall of the stomach. This medicine is also used to treat Dermatofibrosarcoma Protuberans (DFSP) a rare type of cancer that occurs in the deep layers of skin in adult patients. The prescribed dose of Imatinib tablets (Veenat) should be administered orally, along with a meal and a large glass of water. Doses of 400 mg or 600 mg should be administered once daily, whereas a dose of 800 mg should be administered as 400 mg twice a day. Imatinib tablets must not be crushed. Store Veenat tablets (Generic Gleevec) at controlled room temperature (59°F to 86°F, 15°C to 30°C). Protect from light. Protect from moisture. Edema and severe fluid retention have occurred. Doctors are advised to weigh patients regularly and manage unexpected rapid weight gain by drug interruption and diuretics. Cytopenias, particularly anemia, neutropenia, and thrombocytopenia, have occurred. Manage with dose reduction or dose interruption and in rare cases discontinuation of treatment. Complete blood counts have to be performed weekly for the first month, biweekly for the second month, and periodically thereafter. Severe congestive heart failure and left ventricular dysfunction have been reported, specially in patients with comorbidities and risk factors. Monitor and treat patients with cardiac disease or risk factors for cardiac failure. Severe hepatotoxicity including fatalities can occur. patients must be assessed for liver function before initiation of treatment and monthly thereafter or as clinically indicated. Grade 3/4 hemorrhage has been reported in clinical studies in patients with newly diagnosed CML and with GIST. GI tumor sites may be the source of GI bleeds in GIST. Monitor liver function when combined with chemotherapy known to be associated with liver dysfunction. Cardiogenic shock/left ventricular dysfunction has been associated with the initiation of Veenat tablets (Generic Gleevec) in patients with conditions associated with high eosinophil levels (e.g., HES, MDS/MPD and ASM). Bullous dermatologic reactions (e.g., erythema multiforme and Stevens-Johnson syndrome) have been reported with the use of Gleevec. Hypothyroidism has been observed in thyroidectomy patients undergoing Levothyroxine replacement. TSH levels in such patients have to be closely monitored. Fetal harm can occur when administered to a pregnant woman. Inform women of the potential harm to the fetus, and to avoid pregnancy when taking Veenat tablets. Growth retardation occurring in children and pre-adolescents receiving Imatinib has been reported. Close monitoring of growth in children under Generic Gleevec treatment is recommended. Close monitoring is recommended in cases of Tumor lysis syndrome. Reports of motor vehicle accidents have been received in patients undergoing generic Gleevec therapy. Caution patients about driving a car or operating machinery when undergoing treatment with this medicine. The most frequently reported Imatinib side effects with an incidence rate greater than or equal to 30% were edema, nausea and vomiting, muscle cramps, musculoskeletal pain, diarrhea, rash, fatigue and abdominal pain. Please inform your doctor right away in case the patient experiences the following side effects during Generic Gleevec therapy including fever, shortness of breath, blood in their stools, jaundice, sudden weight gain, symptoms of cardiac failure, or if they have a history of cardiac disease or risk factors for cardiac failure. In case of Imatinib overdose the patient should be placed under observation and appropriate supportive treatment should be given. Nausea, vomiting, diarrhea, rash erythema, edema, swelling, fatigue, muscle spasms, thrombocytopenia, pancytopenia, abdominal pain, headache and decreased appetite were observed in case of overdose with 1,200 mg to 1,600 mg a day for a duration varying between 1 day to 10 days with adult patients. One patient experienced nausea, vomiting, abdominal pain, pyrexia, facial swelling, neutrophil count decreased, increase transaminases with a single dose of 6,400 mg.
Veenat tablets are contraindicated in patients with a hypersensitivity to Imatinib Mesylate or any inactive ingredient present in Veenat tablets. Imatinib has been classified by the US FDA as Pregnancy Category D. Imatinib Mesylate (Generic Gleevec) can cause fetal harm when administered to a pregnant woman. There have been postmarketing reports of spontaneous abortions and infant congenital anomalies from women who have taken Imatinib Mesylate. Imatinib was found to be teratogenic in animals. Women must be advised not to become pregnant when taking Imatinib Mesylate. If this medicine is used during pregnancy, or if the patient becomes pregnant while taking this drug, the patient should be apprised of the potential hazard to the fetus.Patients should be advised to inform their doctor if they are or think they may be pregnant. Do not use this medicine without your doctor's consent in case you are pregnant. Stop using Veenat tablets and inform your doctor immediately if you become pregnant during treatment. Patients should also be advised not to breast feed while taking Veenat tablets (Generic Gleevec). You can buy Generic Imatinib online from Clear Sky Pharmacy at a cheap price. Veenat 100 mg and 400 mg pills, manufactured by Natco Pharma Limited, India are supplied in a blister strip of 10 tablets. 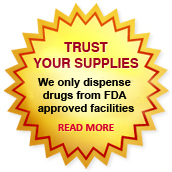 The 100 mg tablets cost only $2.08 per unit when you place an order for 240 tablets.